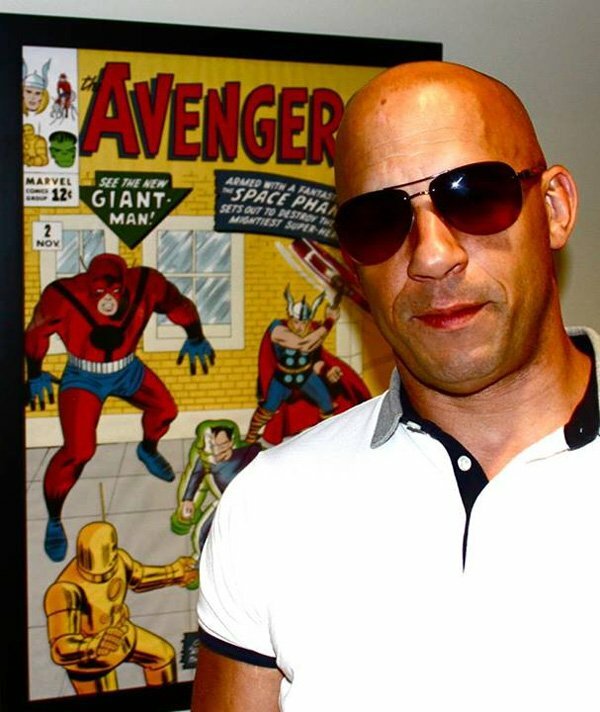 Is Vin Diesel really going to be in a Marvel movie? He's definitely wanted us to think so for a while now, leading us on through a lot of vague Facebook posts, but at Comic-Con this afternoon he finally set a date. During a panel for the upcoming Riddick, Diesel answered a question from a fan about all those Marvel hints with a teasing, "There is some very big news coming at the end of this month." He followed it up, obviously, with a huge smile. So we knew the meeting happened, and that Diesel said it was "wow!" but again, it wasn't wise to get our hopes up. After all this is the studio that has been promising an Ant-Man movie for five years now, and that famously lowballs its actors in paying their salaries. Did they really want to team up with Diesel, who already has the hugely successful Fast & Furious franchise as a bargaining chip? He at least wants us to believe they have, and now all that's left to wonder is what major role might be cast at the end of the month, and how on earth Diesel could play it. Could he be Vision in Ant-Man? Maybe there's a Daredevil remake and he's somehow playing Kingpin? Share all of your speculation in the comments-- after all, fantasy casting superhero movies is what Comic-Con is all about! As for the movie that we definitely know Diesel is actually making, Riddick, you can catch up on that entire panel here. The sequel to Pitch Black and The Chronicles of Riddick was another Vin Diesel dream project that we thought could never be made despite how much he talked about it, and look at that! It's real now. Vin Diesel may be the only human who has successfully channeled the power of The Secret and who can make career-defining things happen simply by talking about them. Bow to his power.